They guaranteed to rot your teeth – well thats what mum told me! The cereal was first introduced in 1952 as Sugar Frosted Flakes. 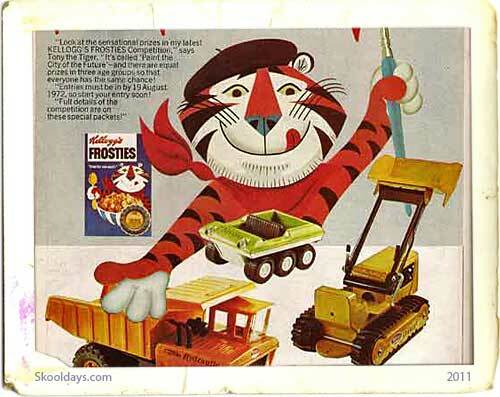 Tony the Tiger has been the mascot of Frosted Flakes since its introduction. Tony the Tiger was originally voiced by Thurl Ravenscroft, who continued until his death in 2005. The character is currently voiced in the USA by the former professional play-by-play announcer, Jim Van Horne, who also played Tony the Tiger in a television commercial in 1997. He can be seen wearing a red ascot on all frosted flakes cereal boxes. In the UK, Tony the Tiger also was voiced by his original voice artist Thurl Ravenscroft but after his death Tom Hill voiced Tony in the UK. Do you think Kelloggs Frosties are greeeeaaaatttttt? This entry was posted in Pop Culture and tagged 1950, 1960, 1970, 1980, 1990 by Skooldays. Bookmark the permalink. The holes are there because its a radio, the sound has to come out of it somewhere!